Here is the Makita 5007MGA 7-1/4″ Circular Saw is one of the best circular saw that is a Pro Framer’s dream tool to have. It combines the performance and power while being supported with superior balance and ease-of-use features. The circular saw is lightweight and portable for the job to job site transporting while being incredibly durable. The saw is equipped with a powerful 10.5 AMP motor and with it weighing just 8.6 lbs means it has a high power-to-weight ratio. The circular saw loaded with a heavy gauge wrap around base made of aluminum that was engineered for extra durability and delivers straighter cuts. The circular saw comes with a large capacity of 2-1/2″ at 90°, 1-5/84″ at 45° while having a max bevel capacity of 0° – 45° which is ideal for standard angles. Users will enjoy the onboard housing for storing the blade, and the wrench plus the flat motor housing design provides stability when switching blades. We also like the easy-to-read markings on the bevel and depth scales. Q - Does this model include a dust blower? Q - Will it come with a case? Q - What are the upper and lower guards made of? A - Both upper and lower guards are made of metal. Q - How many passes would it take to cut a 4x4 using this circular saw? A - Two passes because the maximum cutting capacity is 90° at 2-1/2". Q - Is this say lightweight? A - Yes it is. Q - Is it only ideal for big jobs or can I use it for small jobs, too? A - Yes, It works great for small jobs, as well. Q - Is it a cordless saw? A - No. It is a corded circular saw. We like the easy-to-read large markings on the base, and the circular saw is incredibly user-friendly aside from the safety lock being primarily useful to right-handed users as it would awkward to reach for left-handers. That's the only flaw we see on the saw, thus far. The large motor housing built for extra stability which makes it super easy to switch blades out. It will work great for many applications but since it cuts 90° at 2-1/2" some jobs like cutting 4x4 will require two passes instead of a single run. Users will also enjoy the comfort of a rubberized handle and grip allowing for the longtime user throughout the day without feeling fatigue from vibration. The base is engineered using a heavy gauge aluminum wraparound creating incredible durability and enhancing the operators chance of getting straighter cuts. We also like the strong endurance delivered by the beastly 10.5-amp motor that packs a powerful 5200 RPM (Rates Per Minute) for an outstanding performance made to last the toughest job applications. 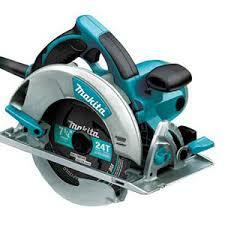 We are impressed with Makita for this lightweight circular saw. The lower and upper guard is made of metal and increases the bevel performance and narrow cutting. It's an all around terrific circular saw. With a circular saw like the Makita 5007MGA any professional or DIY'er would be happy to have this tool in their powerhouse arsenal.